I am a fan of ice cream. If my calorie count can afford it, I will try it. I was reading a blog (for work!) and found this site mentioning this ice cream which came from somewhere like Taiwan or Korea and it is supposed to be really good. My curiosity was piqued because it had flavors or toppings I don’t usually find like honey comb, honey, toasted grains and the like. So on one my work days that I need to go to the stores, I went to SM Aura, and I searched for it. it was beside La Lola Churros (which I have yet to try!). I ordered what I knew I was gonna get the minute I saw it on the menu. The honeycomb. 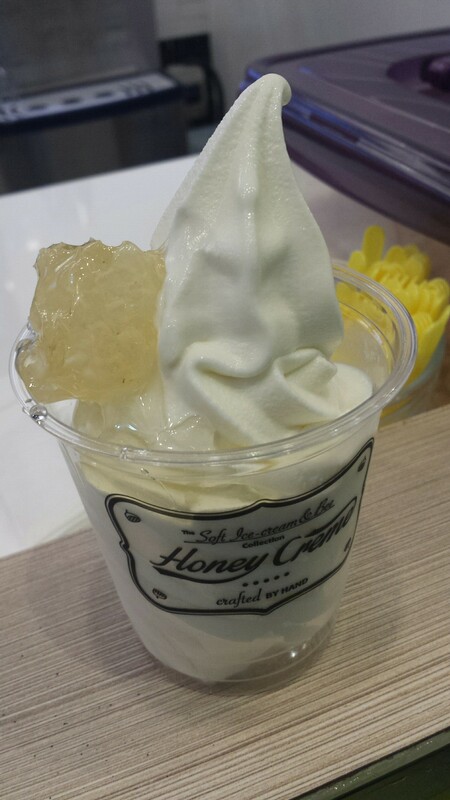 It was basically a milky soft serve ice cream, in a cup, top with a cube of honey comb dripping in it, with an excess of the lovely, lovely honey topped more unto my ice cream!